…rye is not going away – American whiskey tasting no 16. Rye whiskey being the original whiskey distilled by the American colonists, it´s not that surprising that it´s surfacing again in a big way. Totally different from Bourbon and with a character wholly its own it showcases the variety of American whiskey. Here I´m going to sample a few of them. George Dickel Rye Whisky, 90 proof (45%). Yet another one from the Tennessee George Dickel distillery, that I´ve gotten to like a lot through some of my tastings of their other produce. Made from a mash bill of 95% rye and 5% malted barley this is indeed a high rye content whisky. As many other contemporary ryes actually distilled by Midwestern Grain Products (MGP), earlier LDI (Lawrenceburg Distillers Indiana), this brew undergoes additional processing by first chilling and then charcoal mellowing by the Dickel company. Dark gold in colour. A nose first dominated by dry rye spice, followed by a finish of citrus, vanilla and caramel. Neat in a tasting glass there´s an initial dryness giving way to spice, caramel and citrus. The finish is quite long and involves dry spice, some astringent wood and pepper. Sold in the by now easily recognizable Dickel bottles. Functional and alluding to older times. Nothing that really catches your eye. Good, as everything else from this famous distillery, but I must confess to having other favourites amongst the ryes. Woodford Reserve Kentucky Straight Rye Whiskey, 90,4 proof (45,2%). I must confess being a sucker for many of the whiskies from the Woodford Reserve distillery. Their standard output shows high quality, as well as daring to be experimental with other releases. This is an expectedly refined rye packed with taste. Made from a mash bill of 53% rye, 14% malt and 33% corn. Dark gold in colour. A nose characterized by light caramel from the corn and the familiar rye spiciness offsetting the hints of sweetness. Neat in a tasting glass it´s pretty dry despite notes of caramel and fruit, still being offset by a resurgence of spice. A pretty long finish mixing all of the above, while adding some discrete mint at the end. Coming in the regular, very stylish Woodford Reserve bottle it´s looking quiet high-end, and is definitely something I would like to try again. Redemption Rye, 92 proof (46%). Distilled from a mash bill of 95% rye and only 5% malted barley, this rye should be the real thing. Actually manufactured by the ubiquitous MGP, matured in charred new oak barrels for somewhere between 2 – 3 years, and bottled in Bardstown, Kentucky. Deep golden colour. A nose that´s a combination of dry spice, mint and some oak at the finish. Neat in a tasting glass it definitely has its own character. Dry, spicey and again some mint at the finish, with a very discreet sweetness midway. Maybe not something that jumps at you but still with a distinct character. Next project will be trying it in a Sazerac. The whiskey comes in tall and slim bottles, with batch and bottle numbers. Fairly easy to recognize since they certainly stand out amongst the competition in their relative simplicity. Redemption Barrel Proof Straight Rye Whiskey, 121,8 proof (60,9%). As the previous one, this shares the Indiana/Kentucky story, with the same mash bill of 95% rye and 5% malted barley. This time with barrel maturation of 7 years, and bottling it at a whooping 121,8 proof cask strength. My bottle is no 1125 from batch no 4. Dark amber colour. A complex nose with dry rye spice mixed in with the aromatic sweetness of brown sugar. There´s also oak and other spices like cloves. Neat in a tasting glass it´s packs an alcohol punch which is more or less neutralized by a few drops of water. After adding water the sting recedes and you get a strong, distinct rye pepper followed by cloves and liquorice. The middle part manages to keep quite dry in spite of some citrus notes appearing. The finish lingers again on rye spice, but with an addition of astringent oak. This one I really like, and prefer to sample it slowly with different amounts of added clear water. Packaging is different from the producers´ usual high and slim bottles. This one is riffing off the Absolut Vodka design, but with heaps of black wax sealing the cork and half of the bottle. I would say, try it if you can get your hands on a bottle. James E. Pepper 1776 Straight Rye Whiskey, 100 proof (50%). It´s always difficult to know if the ancient history provided by the producers is true or just marketing, but please check out their homepage to make your mind up. A lot of interesting facts on this series of distillates. ( http://jamesepepper.com ). Apparently a whiskey with a very long history, where current owners has worked hard to bring back the original recipes. Quoting a 90% rye mash bill, the rest is supposed to be malted barley. Amber colour. This whiskey has a nose distinctly different from the others tried today. There´s a start of dominant and complex spice – rye pepper, cloves, cinnamon, chocolate – ending with sweet berries. Neat in a tasting glass a few drops of water makes the whiskey bloom with spice, oak, some citrus and a long, lingering finish with some remaining burn despite the added drops of water. Very enjoyable and distinct. Would very much like to lay my hands on the 15 years variety though. Coming in a bottle that would not look out of place in the Mariposa Saloon. No frills just a pretty realized design concept. While their product range is currently not easily available in the whole of Sweden, trying them out seems like a very worthwhile project. This entry was posted in Food & drinks and tagged George Dickel, James E. Pepper 1776 Straight Rye Whiskey, Redemption Barrel Proof Straight Rye, Redemption Rye, Rye Whiskey, whiskey, Woodford Reserve on August 24, 2018 by danolofohman. …rye is in – American whiskey tasting no 7. Produced by the Grand Traverse distillery, based in Traverse City, Michigan since 2008. A small batch craft distillery manufacturing this whiskey from locally produced grain which is triple distilled in a copper pot still, with a mash bill of 60% rye and 40% corn. 2 years of storage in new American oak barrels allows the straight rye label in its name. Apart from this spirit the distillery also makes the rye below, a white dog, a bourbon as well as something called Cherry Whiskey (which I´m not entirely sure if it sounds like a good idea). On their product list is also a rum, a gin and a series of vodkas. There´s strangely enough no mention of this rye in the product presentations on their webpage. Amber colour and with a nose beginning on the fruity side, with some hints of caramel and vanilla, ending with the typical rye pepper spiciness. Neat in a tasting glass it has a fiery start with a slightly disappointing short middle and an equally short spicy finish. In a tumbler with ice the white pepper multiplies and deepens somewhat. Sold in an Absolut Vodka-like bottle with a plastic/cork stopper and a not that exciting label designed to give an impression of old tradition. Apparently both the bottle size and the label had to be changed before exporting it to Sweden. All in all a nice but not spectacular rye, and not something I´m likely to return to. From the same distillery we get another straight rye, this time with a 100% rye mashbill. Double distilled and bottled straight from the barrel without any chill filtering. Rye whiskey being the dominant American whiskey before prohibition, these producers are doing a good job of reacquainting aficionados with the origins. Compared to the straight rye above this one has a nose more dry and spicy, yet aromatic and with more complexity. Neat in a tasting glass it´s pretty smooth, with well defined pepper and spice keeping through a medium long finish that also has a hint of smokiness. In a tumbler with ice the smoothness is accentuated, also creating a fleeting sweetness without actually diminishing the complexity. Packaging is very similar to what I´ve described above, showing that we shouldn´t judge a book by its cover. Feels a bit more special and is something that might actually get a return match. Manufactured by Roughstock distilleries of Montana this is a product of the first legal distillery in the state of Montana in over 100 years. Apart from its rye this small batch distillery also makes two malt whiskies, as well as a spring wheat and sweet corn whiskey that will be reviewed later. Locally produced grains are matched with clear spring water and double distilled in copper still pots, followed by aging in American oak and bottling without chill filtration. When it comes to delivering a 100% rye mash bill it looks like you´ll have to rely on the artisanal distilleries like Roughstock and the earlier mentioned Grand Traverse. The colour is a pleasant amber and we get a full nose dominated by toffee, treacle, cinnamon and spice, with a nice dry character. Neat in a tasting glass we have distinctively dry and peppery notes with some lingering sweetness in the finish. In so many ways solid and feels characteristic of its kind. In a tumbler with ice the white pepper takes charge while still finishing with fleeting notes of sweetness. The Bulleit company started as a way of continuing a family tradition of making American whiskey carried on from the 1830´s. Their output so far has consisted of a small batch bourbon which I like very much, a 10 year old bourbon which is not available in Sweden and a small batch rye reviewed here. With a mash bill of 95% rye and 5 % malted barley this one goes into the high rye content segment. Showing a satisfyingly deep amber colour this whiskey delivers a nose combining a complex spicy dryness with hints of vanilla and mint. Neat in a tasting glass the dry peppery notes dominates along with spices and a fruity sweetness added in the middle, finishing more on the dry side . In a tumbler with ice the dryness continues to develop along with a lingering delicate note of sweetness. The bottle is easily recognized with its glass relief, distinctive form and minimalistic label. A nice design creating a niche of its own. Bulleit rye is a whiskey well worth a repeat visit, just like the small batch bourbon. Sweet. This entry was posted in Food & drinks and tagged Bulleit, Grand Traverse distillery, Roughstock, Rye Whiskey on February 5, 2015 by danolofohman. …it´s time for some rye – American Whiskey tasting no 3. As always with American whiskies there´s a background story, which you can choose to believe or not. At the start of Prohibition in 1920, several residents of the small town of Templeton, Iowa started producing this rye whiskey. Quickly becoming popular, it could be found in Speakeasies in large parts of the US. The favourite whiskey of notorious gangster Al Capone, legend has it that after his incarceration a few bottles even found their way into the cell of prisoner AZ-85 in Alcatraz. 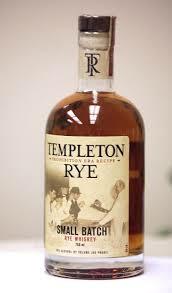 The production of Templeton Rye continued illegaly in small batches even after the end of Prohibition, and was relaunched as a legally produced rye in 2006, with a recipe kept alive by the Kerkhoff family. The mash is unusual due to it´s very high rye content, at least 90%, the rest being malted barley. Fermented with a proprietory yeast strain using a sour mash process. Distillation is first made with a double pass through a short column still followed by a pot still, ending with a 135 proof distillate, matured for at least four years in barrels of charred new American oak. 15-20 barrels containing 53 gallons each are used for each bottling. Since this should translate to roughly 5 700 bottles per batch, the small batch label seems at least reasonably accurate. In a tasting glass Templeton Rye shows a light amber colour and a nose characterized by some early sweetness from exotic fruit and caramel, followed by hints of spiciness, making it distinctly different from the dryness of the Old Overholt tried earlier. The taste is medium bodied and apart from a certain rye spiciness it has light caramel tones while still keeping it´s dryness and avoiding the sweetness of a bourbon. In a tumbler with ice the caramel notes are more evident without really adding that much to the equation. All in all a very nice and smooth rye that deserves to be tried again. Building on a tradition hailing from Benjamin Prichard in 1822, Davidson County, Tennessee, the present Prichard´s distillery was started in 1997, making it the first legal distillery in Tennessee since Prohibition. The bottles from Prichard´s has a very distinctive design making their product line easily recognizable. The both beautiful and exclusive look fits well into the concept of a small high quality distillery. This particular spirit is made from American rye, distilled in copper pot stills and matured in small barrels of American oak. Regrettably, not very much detailed information on the production of this rye is available on the net. In a tasting glass it shows a pleasant amber colour, deeper than the Overholt and Templeton. The nose is at the first whiff dominated by strong notes of burnt sugar, which softens into something more caramel-like after giving the glass a swirl and letting it settle. Despite the caramel, it still keeps the dryness that could be expected from a rye, and some spicy, peppery tones in the finish. The taste carries a lot of spice, together with the typical rye dryness and a certain burn continuing well into the finish that is nevertheless quite smooth. Trying it in a tumbler with ice releases hints of caramel sweetness but dilutes the overall experience, and is not something I feel contributes to the experience. 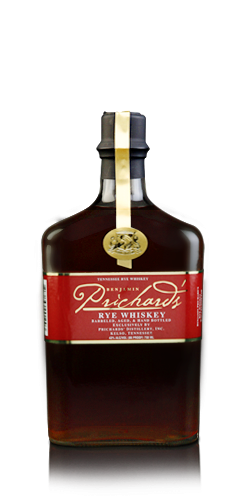 Prichard´s rye has the feeling of a carefully crafted whiskey, with a lot of personal characteristics while still being a good representative of its type. Claimed to hail from the first American whiskey distilling company, formed in Pennsylvania 1753, the present Michter´s set up operations in Kentucky in the 1990´s. The recipe of Michter´s rye has actually been the same since 1753, and legend has it that George Washington used it to warm the troups of the American Revolution. Modern day Michter´s is made under the strict quality control of Master Distiller Willie Pratt, and doesn´t leave the barrel until he deems it´s reached the right degree of maturation. The whiskey is barreled at a lower proof than what´s usually done, and then stored in a special heat-cycled warehouse, claiming to make it richer and smoother while on the other hand losing more to evaporation. In a tasting glass we get a nice amber colour, slightly darker than Pritchard´s. The nose has some aromatic corn sweetness, but is still clearly dryer than Pritchard´s, and with a full and spicy rye character. The middle and finish of the nose is quite long and complex, making it very enjoyable to stick your nose into the glass for a long time. There´s a distinct rye dryness to the taste with some hint of caramel in the beginning. The burn in the middle is followed by a fiery spiciness carrying through to the finish, which ends with a slowly fading tone of light white pepper. Trying it in a tumbler with ice diminishes the burn and lets some of the complexities come forward a little bit more. It might be a good idea to drink this whiskey with a small splash of water. So, to sum things up – all of these nice ryes are good in their own way, with Prichard´s and Michter´s feeling a little bit more special. I´m going to return later with separate tastings of several of the whiskeys from both their product ranges. This entry was posted in Food & drinks and tagged Michter´s, Prichard´s, Rye Whiskey, Templeton Rye on May 4, 2014 by danolofohman.